Large human crowds can sometimes do things that are really cool. That's the subject of Chris Anderson's latest TED talk: 'How web video powers global innovation'. Online video radically changes the reach and speed of the improvement cycle. Things like music and dance, keep getting better, and innovation is getting faster, because artists see the best and improve on it. "Dancers have created a whole global laboratory online. Kids in Japan are taking moves from a YouTube video created in Detroit, building on it within days and releasing a new video, while dancers in California are taking the Japanese video and remixing it to create a whole new dance cycle"
Ba Cissoko - New Album - 'Seno'!! 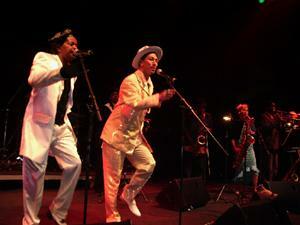 I first encountered Ba Cissoko in their home in Marseilles during a packed performance at Club de Sud. Guinean kora master Ba Cissoko and his troupe feature not one, but two kora players, a bassist, and a percussionist. They started out in a pretty standard Afropop groove and then one of the kora players would quick his effects box rack and start wailing out an improvisation kora lead like you might hear from Eric Clapton -- except he's playing with two fingers...his whole body would light up and lift off the stage. the crowd just went nuts!! On their latest album, 'Seno', they manage to create a brand new sound which has rare cross-generational appeal back home in their native Guinea. The old people love it because it reveres the venerable tradtions of the griot and the kora. The youth love it because it twists and moulds that tradition into enticing new forms. Check out the new album by these boys, you won't get dissapointed! Get music from Ba Cissoko here!! The idea of creating a Cuban ska band originated with Peter A. Scott, a British entrepreneur and music lover whose business ventures brought him regularly to Jamaica and Cuba. Scott invited Natty Bo, a renowned London ska singer and devotee of all things retro, to travel with him to the city of Santiago de Cuba, often called the cradle of Cuban music because of its influential role in the development of popular Cuban music, to record with some of the best local musicians. Natty Bo, also a popular London DJ, was an avid collector of old Cuban 78s, and suggested bringing other flavors into the mix such as Colombian cumbia, Jamaican mento and Trinidadian calypso. While in Santiago, Natty Bo heard Cuban crooner Beny Billy, the living reincarnation of the legendary Beny Moré, belting it out in a bar, and knew then and there he had found his vocal counterpart on the project. Back in London, Natty Bo formed a band featuring the leading maestros of Cuban and Jamaican music, and the group set about bringing the irresistible Ska Cubano sound to the concert stage. The rest, as they say, is history, or at least, historical revisionism, as Ska Cubano posits a world where the music of Caribbean cousins Jamaica, Cuba and beyond developed a closer kinship back in the day before reggae and salsa shook the globe. Get more music from Ska Cubano here!! Kafala Brothers - FREE Song: 'Salipo'!! Today's FREE Song is from Angola! Born in the village of Mazoso, in the province of Benguela, Angola, Moises and Jose Kafala both rose to national fame individually before their debut performance together in Luanda. 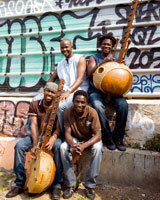 The Kafala Brothers' music is best described as Angolan folk music. Their songs are revolutionary in nature and reflect real life experiences, while painting poetic portraits of Angola's 30 year long war and continued struggle for national reconciliation. Using a single guitar and a flute, the Kafalas are able to tell stories of war, sadness, love and joy with conviction and heartbreaking vocal harmonies which have been known to provoke uncontrolled tears to well up in the eyes of those listening. Get more music from Kafala Brothers here!! Coco Mbassi - FREE Song: 'Na Menguele'!! Today's FREE Song is by Coco Mbassi, She is Cameroonian, but she is principally based in Paris. 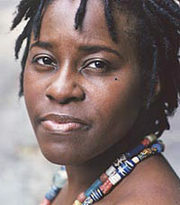 Winner of the 1996 Radio France Internationale Decouvertes 'prize in the African music category, she is both an author and a composer. Coco's songs tell stories often based on personal life experiences that she recalls. It's these stories and feelings that make her songs what they are today, and a great deal of these memories are made up of those old sepia-colored (black and white) photographs from home. With a postgraduate degree in translation she began singing lead and chorus in the African gospel choir "Les Cherubins" and as a backing vocalist, she collaborated with various artists like Salif Keita, Oumou Sangare, Manu Dibango and Ray Lema. The words to the songs of her mother tongue, Duala, are often found combined with jazzy, minimalist and classical arrangements, where vocal polyphony and African rhythm continue to play an important role. Coco Mbassi composes her own pieces and writes the words. Although her husband - who teaches as classical double-bassist - exercises a strong influence on her music writing, in her childhood she was permanently exposed at home to a wide variety of Händel, Makossa and jazz bigbands. Get more music from Coco Mbassi here!! Frédéric Galliano - FREE Song: 'Isto é kuduro w/Zoca Zoca'!! Today's FREE Song is by Frederic Galliano and the Kuduro Sound System! French DJ, Frederic Galliano, has been working the French groove scene since 1994. He put together his own label, Frikyiwa, with artists and bands such as Hadja Kouyaté, Baye Coly, Néba Solo, Ali Boulo Santo, and others. His latest project, 'Kuduro Sound System', is all about dance and takes us across the continent of Africa to Angola. The Kuduro was born in 1996 in Angola. Created by Tony Amado, the Angolan's Grandmaster Flash. Kuduro is an African electronic production, and Galliano's beats are a savant mix of programming inspired by Angola's carnival. Just check out the moves on the Kuduro Sound System's live video and you'll be a believer!! Get more music from Frederic Galliano here!! K'naan - FREE Song: 'Strugglin' (Live)'!! K'naan, “the traveler”, fled war-torn Somalia at the age of thirteen on what turned out to be the very last commercial flight to ever do so, amidst a crumbling society and the end of any form of centralized government. He arrived in Toronto with a very strong sense of purpose, and it is this sense of purpose as well as his amazing lyrical gift, which has made him a beacon for other artists as well as those dedicated to global change. 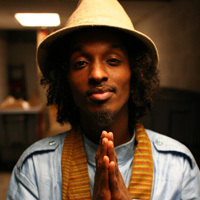 K’naan emerged on the International scene with his debut album “The Dusty Foot Philosopher” in 2005. He took home the 2006 Juno Award (Canada’s Grammy) for Best Rap Recording and received newcomer of the year at BBC’s World Music Awards. In the last 2 years he has played over 350 shows touring 5 continents recorded and sharing the stage with Damian Marley, Mos Def, Talib Kweli, M1, Youssou N’Dour, Amadou and Miriam and many more. These artists celebrate the relevance of his political poetry, live performance and purpose-driven mission. K'naan’s music is truly a vehicle to raise awareness. He is an artist with a message; as such, his music and his actions have placed him in a position to speak out for the voiceless while informing, empowering and inspire the masses. Get more music from K'naan here!! RV Babe - FREE Song: 'African Boy (African Tribal Mixx)'!! In 2000 Luis Maruwasa started one of Namibia’s major hip-hop establishments, Tha Syndicate. The fundamental ideology that brought Tha Syndicate into being was that Tha Syndicate was principally to be a custodian of a near helpless juvenile Hip-Hop culture amidst a prejudice and unwelcoming nation which could not allow it to flourish like other kinds of “Acceptable” music styles. Hence Tha Syndicate’s only aim was to nurture and nourish such a “being”. The World over, Hip-Hop has not seen a revolution since 93 or so, but Namibian Hip-Hop has possibly experienced many revolutions in itself. Aided by only an arsenal of skilled MCs, Luis managed to set Tha Syndicate to sail into a horizon of what seemed to be the future of Hip-Hop in Namibia. RV Babé Vol.1 reaches in even further than might have been expected or anticipated by music fanatics and critics alike. RV Babé Vol.1 may not in itself be revolutionary but rather a renewal of music, a new beginning. Get more music from RV Babe here!! Aconcagua - Pablo Carcamo - FREE Song: 'Paseando' (Walking/Spaziergang)!! Today's FREE Song is by Aconcagua - Pablo Carcamo! Aconcagua, a project of Pablo Carcamo, brings to you all the pan pipes and flutes from Bolivia, Peru, Ecuador, Chile and many other South American instruments. The music, played by the versatile multi-instrumentalist and musical genius Pablo Carcamo consists of traditional from the Andes and original music by Pablo. Soar with the condor to the music played on kenas, zamponas, moceno, rondador, charrango, cuatro, guitars, bombo and various percussion. If you like South American panpipe music you will love today's free song! Get more music from Aconcagua and Pablo Carcamo here!! Brother Resistance - FREE Song: 'Jah Never Fail Me Yet'!! Today's FREE Song is from Trinidad & Tobago! The name of Brother Resistance has long been associated with the artform called Rapso. It is an art form that many feel he invented. But Brother Resistance himself insists that Rapso can be traced back to the oral traditions of Africa, when the Griot was the historian, counselor and poet of the tribe. After the middle passage, on the sugar-cane plantation, the Griot's name was changed to Chantuelle. The role played by this individual was transformed as well, and he became the voice that made the suffering of the slaves bearable. The evolution of the Chantuelle saw the emergence of the talkers of the early Carnival, the Midnite Robbers, the Pierrot Grenades and also the Calypsonian. The Rapso artiste is therefore the revitalisaton of the old Griot / Chantuelle traditions in perspective of our modern-day society. Resistance, as he is commonly called, is considered the spearhead of the Rapso movement, a movement born almost thirty years ago, when the late Lancelot Layne successfully challenged the musical and literary status quo of the Caribbean. Drawing on the folk traditions of the Carnival characters of Trinidad and Tobago, Layne recreated the vibes of the "Chantuelle", "Pierot" and "Midnite Robber" to establish the reality of what is today called Rapso. The musical experience, which fueled the new art form, came directly out of the steelband yards, the drum yards and the calypso arena. The vibes and the flavour came out of the social movement of a people for true liberation and self-determination. The birth of the Network Rapso Riddum Band at the end of the 1970's with its lead chantuelles, Brother Shortman and Brother Resistance heralded the new reality of roots music from Trinidad and Tobago. The music now as defined by Brother Resistance is "the power of the word, in the riddum of the word." In essence, it is the poetry of Calypso blended with the African rhythms of Trinidad and Tobago. It is also referred to as the Rap of Soca. It is interesting to note that paralleling the development of Rapso in Trinidad and Tobago was Dub Poetry in Jamaica (the Poetry of Reggae) and African-American Rap music in the United States of America. Get more music from Brother Resistance here! !